HeatSavr is a permanent solution for a pool cover, and can be easily applied in either a residential or commercial setting. HeatSavr forms a transparent layer of protection on the surface of the water, creating a barrier between the pool surface and the air above it. This barrier is what keeps the water and heat in the pool. Liquid Pool Cover is biodegradable and completely safe for all swimmers and pool equipment. It has been FDA and EPA approved for use in all swimming pool environments. It has also been approved by the NCAA Rules Committee for use in pools used for NCAA Competition and Trials. Being able to flow over the pool surface allows for the Liquid Pool Cover to maintain coverage over even the most unusual shaped swimming pools found across the world. Whether your pool is a "L" shape, "Lagoon" shape or a "Free Flow" design as seen in a Water Park, HeatSavr Liquid Pool Cover will cover the entire surface area. Twenty plus years of studies have proven HeatSavr to cause NO harm to filters, pumps, skimmers, heaters or any pool associated equipment for that matter. The ease of use, safety in applications and eco-friendly aspects of the HeatSAvr Liquid Pool Cover is what sets it apart from the standard mechanical pool covers available today. A pool cover is only effective if you use it. With most mecahnical pool covers, the problem I have seen is actually putting it on and pulling it off the water surface. Of course they make automatic covers, but rarely do you see this in a commercial application. Mostly because of the size difficulties. The drag created by surface friction calls for a great deal of effort to remove the cover. What happens is the cover ends up being never used. 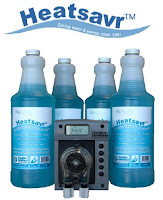 Flexible Solutions introduced a new formula for HeatSavr as of December 1, 2011. This new formula replaced the traditional main ingredient, Isopropyl Alcohol, with the more environmentally sustainable Ethanol. Ethanol is "bio-based", being made primarily from corn. The recommended dosage rate for HeatSavr is 1 ounce per day for every 400 square feet of pool surface area, or approximately 15,000 gallons of water. There are a few ways to apply HeatSavr, but I recommend using the automatic metering pump to dose you pool. It is a "set and forget" system, with the exception of changing the bottles when they get empty. You can use the one gallon size also, especially for larger dosing requirements, Or after you use the amount in the kit, you can buy by the gallon to save time and money.